2019 Commonwealth Scholarships are open! Applications for 2019 Commonwealth Master’s Scholarships and Commonwealth PhD Scholarships are now open for candidates from low and middle income countries. Funded by the Department for International Development (DFID), these scholarships enable talented and motivated individuals to gain the knowledge and skills required for sustainable development, and are aimed at those who could not otherwise afford to study in the UK. Higher education in Denmark is free for students from the EU/EEA and Switzerland and for students participating in an exchange programme. For other students annual tuition range from 6,000 to 16,000 Euro. A number of scholarships and grants are available from the institutions and from public funded schemes. CLICK HERE TO READ MORE! The availability of a scholarship is often key in the choice for an international learning experience. This is why we see solid scholarship management as a core responsibility. We manage various scholarship and funding programmes on behalf of the Dutch government, foreign governments, private donors and the European Commission, as well as programmes resulting from bilateral agreements between specific countries. Posted by utechalumni in JOB VACANCIES, Scholarships. We have been meeting a number of our UTech, Jamaica graduates who are pursuing further studies at the University of South Wales. They indicate that the scholarships are generous. If acquiring an advanced degree is a career goal, we encourage you to do additional research on this institution. Posted by utechalumni in JOB VACANCIES, Professional Development, Scholarships. Hi Grads, this appears to be an annual programme. The deadline of this year has passed. However we share it for your awareness, noting, and preparation from now for future application periods. Through this structured three-year program, you will work in an intellectually challenging and culturally diverse environment within a specific practice, region, or corporate unit in the World Bank Group, which includes the World Bank, the International Finance Corporation (IFC), and the Multilateral Investment Guarantee Agency (MIGA) and International Center for Settlement of Investment Disputes. You will have the opportunity to contribute and grow your skills in areas ranging from analytics, research, data management, project management, communications, finance, management accounting, and information technology. In addition, the program offers various cohort activities aimed to broaden your exposure to the work of the World Bank Group and develop leadership skills. CONTINUE READING HERE! Posted by utechalumni in Scholarships, UTech Scholarships. ATTENTION: Freshmen students at UTech, Ja. The Hill family established the Tyrone McArthur Hill Memorial Scholarship Fund (US$750.00 contribution towards tuition fee, books, and/or related school expenses) to honor the life of Tyrone McArthur Hill as a loving father, diligent construction/engineering professional and outstanding former student at University of Technology (C.A.S.T.). Scholarships are awarded to students who have overcome life’s obstacles. -Be an entering 1st year UTech, Ja. student in the fields of construction, engineering, and/or architecture. 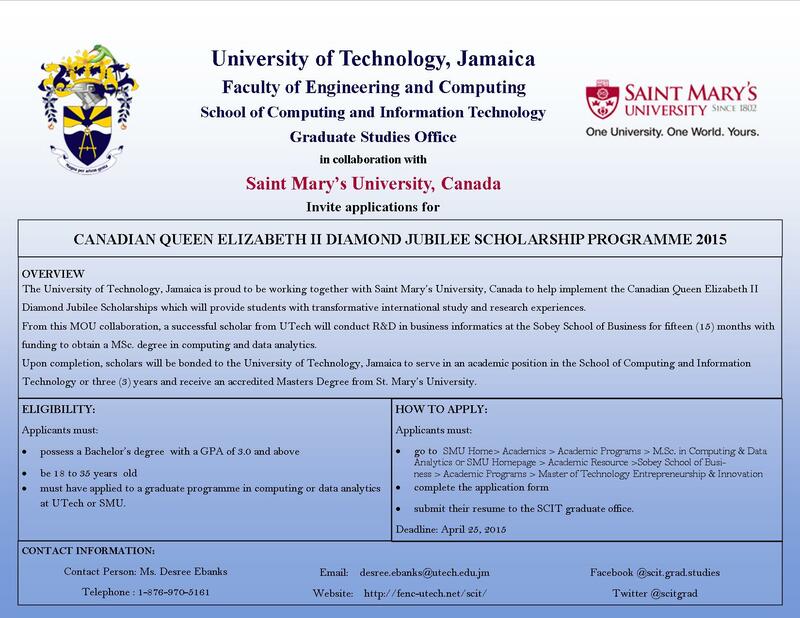 Below please find information on scholarships available to new and returning students of the University of Technology, Jamaica for Academic Year (AY) 2015-16. Posted by utechalumni in Personal Development, Professional Development, Scholarships. On Tuesday, June 9, 2015, the Australian High Commission, invited the public to attend a Higher Education Outreach information session at the University of Technology, Jamaica (UTech). Please see some of the resources shared below at the information session. UTech invites all interested Alumni to conduct research and verification on opportunities for study in Australia. We wish all our CAST-UTech Graduates the very best experience in the ongoing development of your personal and professional lives! Posted by utechalumni in Scholarships, UTech News, UTech Scholarships. Please check out the following Scholarship opportunities to learn whether any apply to you. Many people turn to further education as a proactive way of dealing with a contraction in the job market within their countries. If you are having a challenge finding a job, pursuing a scholarship to develop yourself professionally is a good choice, and well worth considering. Please see 3 such options below.